Original car with all new interior. Many extras to go with. Lots of nostalgia parts and much more. 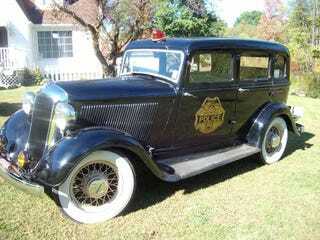 retired Police car, but no docs to prove, so sold as a regular car. all the decals, siren, bubble, and constables hat are included along with the letter saying its ok to run this stuff in parades, shows etc. Rust free. Runs and drives as new. Can drive anywhere. 1 of a kind find.